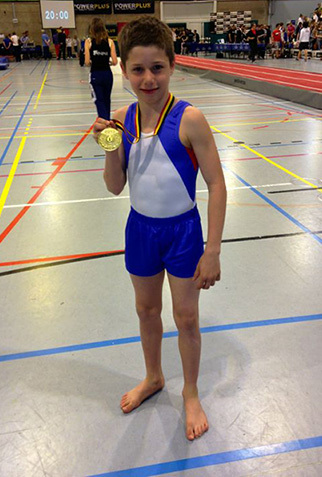 Congratulations to Jaydon and coach Chris Porter who traveled to Mortsel, a city and municipality in province of Antwerp, to represent the City of Birmingham GC in the Belgian Open Tumbling Championships on Sunday 5th May 2013. Jaydon took part took gold medal position in the ‘Miniemen Jongens’ section of the event which is the 11/12yrs age group. He performed two well executed tumble runs; the first consisted of six whip somersaults into full in back out, the second: six whips into double tuck somersault. Interestingly Jaydon’s score was also higher than the highest scorer in the next age group up. Good start to the competitive year and a good warm up for the British Championship qualifiers on 12th May in Wakefield.